Good morning everyone! I wanted to update you all on the Hot Moody Mess program I just completed! If you would like to read/review my previous posts on this please go here and here. I don't think I mentioned before what H3:60 actually stands for - but I was reminded by looking at the flyer they just sent me. And I wanted to share that with you. It means: "Happy, Healthy and Hot in 60 days." Well you may be wondering if I achieved this? In 60 days. Well I think I am on my way to that and this program really helped. Right from the start this is very helpful you get weekly information. That you can access on the site - which provides info on good foods to eat, whole foods, smoothie recipes, with audio and videos to watch to get you inspired too. And a lot more! There are also group phone calls - which I admittedly at first was hesitant about. I was pretty nervous the first one and I really was never of a group sharer. But I actually really ended up liking the group calls. And got a lot out of them. You get to talk to the coaches and get their advice on what has been going on. And you also get to hear the other members questions. Which was very beneficial. To be Honest, I am also pre-menopausal, and the coaches Tawny & Stacie even gave some advice on that. Like what supplements and herbal medicines too that can help with that. At the end of the program, on the 8th week you also get access to everything you need to know for a week detox. Everyone (if they want) can do the detox for a week and it helps cleanse out your system and drop some pounds. And don't worry - you actually get to eat on this detox. From the beginning of the program til after the detox - I had weighed myself - and I lost almost 10 lbs.! I saw someone else who posted a similar pic like this that did the H3:60 on her blog. So I am too. 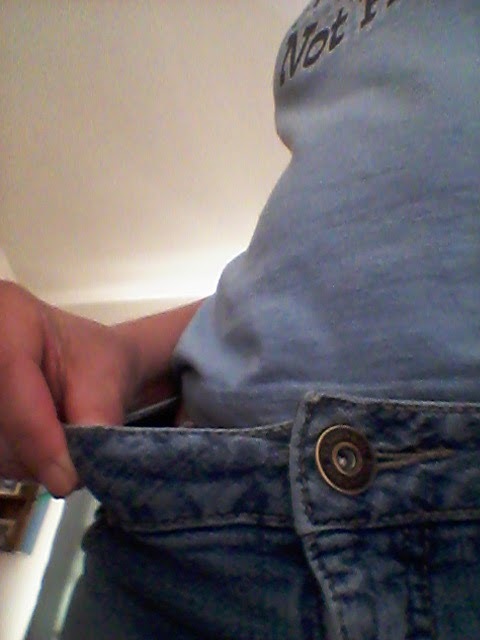 These shorts used to just fit me - now they are pretty loose! There is so much more to this program that I can not begin to explain here, but if you have any questions - I will try to answer them or you can contact the ladies from Hot Moody Mess yourself. THIS REALLY IS A GREAT PROGRAM & IT DOESN'T STOP AFTER 8 WEEKS YOU GET ACCESS TO ALL THE INFORMATION EVEN AFTER THE PROGRAM IS OVER from the website - along with access to the private FB page even after the program ends! Disclosure: I am being sponsored to participate in this program & share this with you. All opinions remain my own though. That's awesome that your shorts are loose now! Keep up the good work. Hi Susan! This looks like a great way to lose weight, and healthy. I would especially be interested in the good foods to eat, smoothie recipes and the videos. That sounds like a pretty amazing program. I wish you a lot of luck on the completion of the program. Keep up the amazing work. Your shorts are looking good.